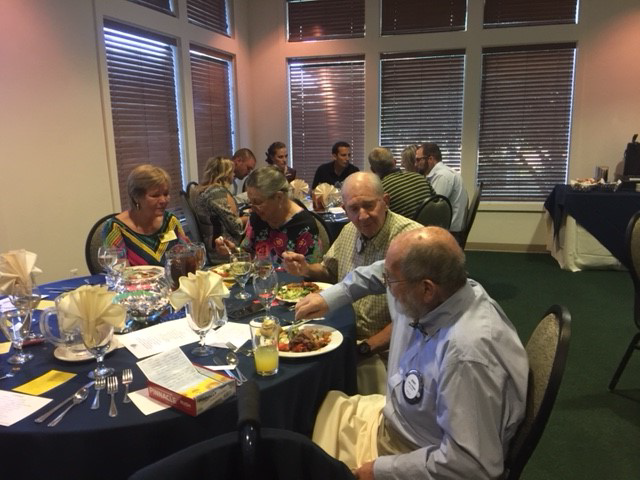 The Sierra Vista Rotary Club met for its 58th annual "Change of the Guard" meeting on Monday, June 11, 2018 at 6:00 PM in the Pueblo Del Sol Country Club meeting room. Outgoing President Nancy Fusco compiled a PowerPoint presentation of photos from the events that made up the 2017-2018 club year playing throughout the evening. 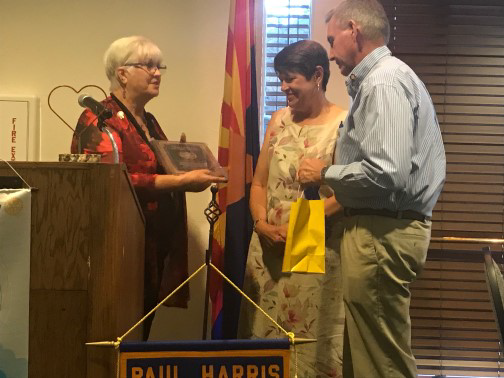 Guests included Nancy Cassell, Past District Governor of District 5500 and Henrietta "Hank" Huisking, Assistant District Governor, both members of the Sierra Vista West Rotary Club, and the spouses, partners and friends of members of the Sierra Vista Rotary Club. President Nancy called the meeting to order at 6:00 PM. Following the pledge of allegiance, reflection, and recitation of the Rotary 4-Way Test (plus 1), K.J. Wigton lead the club in singing "When Irish Eyes are Smiling" in honor of incoming president Jerry Regan. The meeting was then dismissed to enjoy the buffet dinner. President Nancy delivered a summary of the club’s accomplishments for the 2017-2018 year including examples of how the Sierra Vista Rotary Club made a difference in Sierra Vista and beyond by "Doing Good." The examples included donating books to the Boys and Girls Club and donating both dictionaries and Thesauri to students in the Sierra Vista schools; building a playground for the children living at the Forgach House in conjunction with the Sierra Vista West Rotary Club; participating in Toys for Tots at Christmas; donating approximately $300.00 of food items to various food pantries in the Sierra Vista area; working with the Agua Prieta, Mexico Rotary Club through an international grant to build a covered bus stop in Agua Prieta so that the children waiting to take the bus to school would have both shelter and shade. The Sierra Vista Rotary Club raised sufficient funds to provide six one thousand-dollar scholarships: five to high school seniors and one to a student at Cochise College. The Club also made its first $2,000.00 Joe Britton Memorial Vocational Scholarship in honor of Joe Britton, a long time Sierra Vista Rotarian and Vocational Chairman of the Club who passed away. Other money raised by the Club made its way to grants for non-profit organizations who needed additional monetary assistance. Individuals honored by President Nancy included Barb for her work on the Food Drive; Elsie, who along with Angie and Dan, worked on the scholarship committee and provided support to Nancy; John Black, for his 12 years of participating in the Ride to End Polio; Steve Johns for stepping in to fill part of the void from Rich Besselman’s death and Randy and his spouse Rose for taking over the 4th of July planning. Nathan Williams was not present but was thanked for his work with the youth, making sure that the high school students selected for the Rotary Youth Leadership Academy made it to Flagstaff, and her husband, Sierra Vista Rotarian Bob Fusco. President Nancy introduced her Board and presented them with gifts to thank them for their guidance and help, Board members in attendance were Jerry, Dan, Ken, Mike, Les and Poppy. Missing were Joe, Angie and John Spengler. Assistant Governor Hank was thanked for her guidance and help through the year. Les was announced as the Sierra Vista Rotary Club’s Rotarian of the Year. President Nancy recounted the work and support Les provided in the construction of the playground at the Forgach House and the tree planning project. Les and his wife Kathy were thanked for their outstanding service to the Club, including Kathy opening her home for "Firesides" for new and prospective members, and each was given a gift from President Nancy. Les was also presented with a plaque. 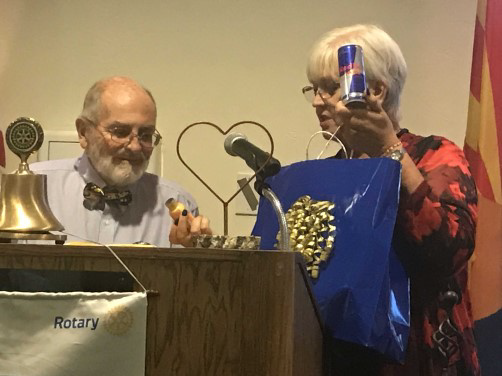 Following her speech, President Nancy again introduced Assistant Governor Hank who gave the Club a brief "heads up" on incoming District Governor Kirk Reed’s 3 areas of focus: 1) Membership; 2) the Rotary Foundation and 3) promotion of the Rotary brand. AG Hank then called up Jerry as the incoming president, Fred as president elect, Mike as secretary, Chuck as Sgt. at Arms, and Nancy as vice-president. Jerry and his officers were then installed by AG Hank. As his first acts as president, Jerry presented pins to Nancy as past president and to his officers. Jerry then talked about his health issues and about being vertically challenged. He thanked Nancy for her amazing accomplishments in the past year and gave her a bouquet of roses. Nancy then returned the favor by presenting President Jerry with a series of gag gifts—a compass with a whistle so that he could find his way and could call on members for help; a "Magic 8 Ball" for assistance in making decisions; some freeze and serve Bahama Mamas; and other gifts which she assured President Jerry would make his year much easier and more memorable. She finally turned over, after verifying that Mike observed her doing so, the post office box key. President Jerry introduced his Board: Lou, Vocational Service; Ed S., Community Service; Carlos S., International Service was not present; Youth Service, Dan; Fellowship, Ken; Foundation, Les; PR, John Spengler and Steve Johns. Event leaders were introduced as Randy and his wife Rose for the 4th of July; Joe and Elsie for Project Graduation; Fred for the Barbecue Bash; and Frank Gonzales as Jerry’s special assistant. President Jerry presented Nancy with a lovely, blue glass award for her service as president. He announced that he and Fred provided the dessert and before closing the meeting and inviting all to share in the chocolate cake, he left the those in attendance with the thought that to make the world a better place, we "only need a heart and a soul generated by love."